Cold chain logistics solutions are becoming more sophisticated to meet the increasing complexities and scale of the cold supply chain in clinical trials. At least 20% of clinical trial supplies require cold chain logistics (2 to 8 degrees Celsius) today. Growth in biologics and personalized medicines will drive this up. By 2020, 8 of the top 10 pharma products will require cold chain supply handling. Ambient products may also need monitoring as regulatory guidelines tighten for the global supply chain. Our GMP facilities are monitored by a Harmonized Environmental Monitoring System (HEMS), providing global 24/7 monitoring of all our temperature controlled areas from any of our locations along the global supply chain. Redundancy in cooling / refrigeration systems and back-up generators help ensure temperature ranges are always maintained. Shipments are appropriately packaged to maintain temperatures and monitored by loggers. Sensor, mobile, cloud and analytics technologies are becoming available that will enable greater visibility and control of cold chain supplies throughout the cold supply chain of custody. Temperature and other environmental factors such as humidity, shock, and light exposure will be able to be reported in near real-time, enabling a faster response to any quality issues that are detected, and avoiding delays in having medication available at scheduled patient visits. In addition to monitoring temperature and other environmental factors, the availability of near real-time location information can be used to enable geo-fencing to detect when a shipment has deviated from its expected route, been delayed (for example, at border controls); or if a kit is removed from a storage location. This is particularly useful for high-value or controlled substances. By aggregating data from depots, shipments and sites, it will be possible to get a complete picture of the status and journeys of medication kits, enabling accumulated temperature (mean kinetic temperature) / other environmental factor management, so that you have an accurate assessment of drug quality before dispensing to patients. The accumulated data across multiple supply chains and studies can be used to identify and predict trends, enabling optimization of the supply chain. Where are your investigational medicinal products (IMPs)? Have they experienced temperature excursions or delays? When it comes to the clinical trial supply chain, it’s more important than ever to have timely answers to those questions. That’s because the cost of clinical trial supply is increasing; GMP, GDP and GCP regulation is tightening; and the number of temperature-sensitive shipments (including biologics and personalized medicines) is growing. With PAREXEL’s Active Tracking service, we can monitor your product shipments and take timely actions in the event of temperature excursions or delays. Cold chain logistics is becoming more sophisticated to meet the increasing complexities of the global supply chain and the cold supply chain in clinical trials. This on-demand webinar discusses the challenges that brings to clinical trial supply management for sponsors and their sites, and explores solutions for shipment and site monitoring. In this day and age, most modes of transportation can send a constant mass of sensor data to central servers, with almost 50% of the world’s population using a smartphone. So what is the biopharma R&D industry doing in terms of data capture within the clinical trial supply chain? The emerging Internet of Things offers companies a complete, real-time end-to-end overview of their pharmaceutical products as they travel from manufacturer to depot and investigational site to patient. 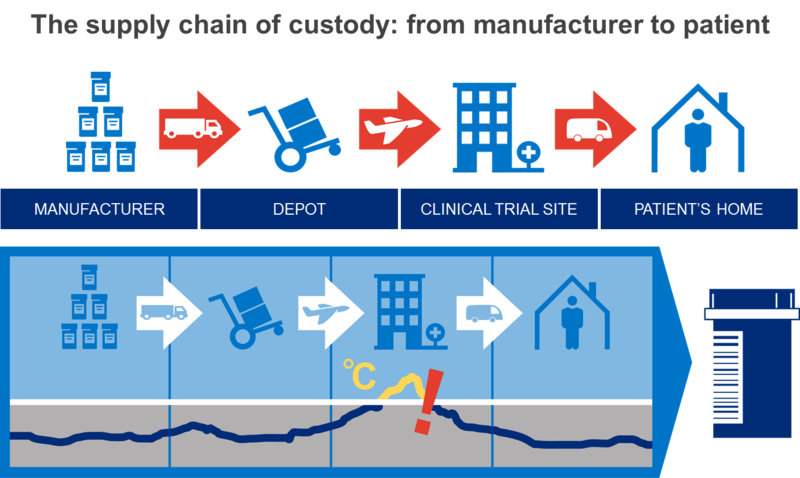 Read about the clinical trial supply cold chain challenges, the limitations of conventional solutions and the benefits of a real-time clinical trial supply control capability. This webinar discusses the challenges that lack of visibility and traceability present and examine how mobile, cloud and analytics technologies can be applied to enable proactive management of the supply chain. It’s 2016: airplanes, ships, trains and even cars send a constant mass of sensor data to central servers. Almost 50% of the world’s population uses a smartphone. We communicate with these mobile computers continually, globally. So what is the biopharmaceutical R&D industry doing in terms of data in the clinical trial supply chain? Read this article to see PAREXEL's view.